After Queen Elsa, born with the power to create ice and snow, accidentally traps the fair kingdom of Arendelle in eternal winter, her younger sister Princess Anna sets out to find her and make things right. Anna and Elsa appear within the first two minutes of Frozen, released on November 27th 2013. 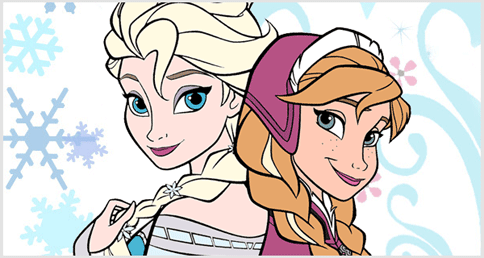 They are first seen in Elsa's room in the early morning as Anna attempts to wake Elsa up to play. 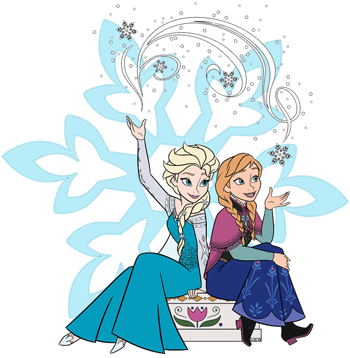 Subsequently, the sisters appeared in the short films Frozen Fever and Olaf's Frozen Adventure and the motion picture Ralph Breaks the Internet: Wreck-it-Ralph 2. A sequel to Frozen, simply entitled Frozen 2 is scheduled for release on November 22nd 2019. The name Anna is a latin form of Hannah, meaning "gracious" or "full of grace". The name Elsa is a form of Elizabeth, meaning "God is my oath". In the Hans Christian Anderson tale The Snow Queen (the inspiration for Frozen), there is no Anna or Elsa. The protagonist is a little girl named Gerda.